INDICATIONS AS AT 8 SEPTEMBER 1997: TENORMIN is indicated in the management of: (i) All grades of hypertension, including hypertension of renal origin. (ii) Frequent disabling angina without evidence of cardiac failure. (iii) Cardiac arrhythmias (acute treatment of supraventricular and ventricular arrhythmias including those associated with acute myocardial infarction). (ii) Myocardial infarction - Late intervention (beta-blocker class effect greater than 12 hours after onset of chest pain). 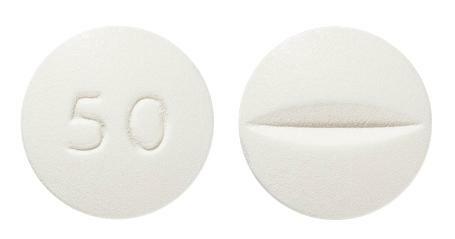 White, round biconvex, film-coated, tablets which are intagliated with 50 on one face and bisected on the reverse face. Consult your doctor before taking large amounts of Vitamin K (Green leafy vegetables). Take 30-60 minutes before meals, take at the same time each day. Beta-1 selective blockers are a subclass of beta blockers that are commonly used to treat high blood pressure. Drugs in this class include atenolol (Tenormin), metoprolol (Lopressor), nebivolol (Bystolic) and bisoprolol (Zebeta, Monocor). We developed a comprehensive methodology to examine how different doses and drugs in this class of drugs lower blood pressure.